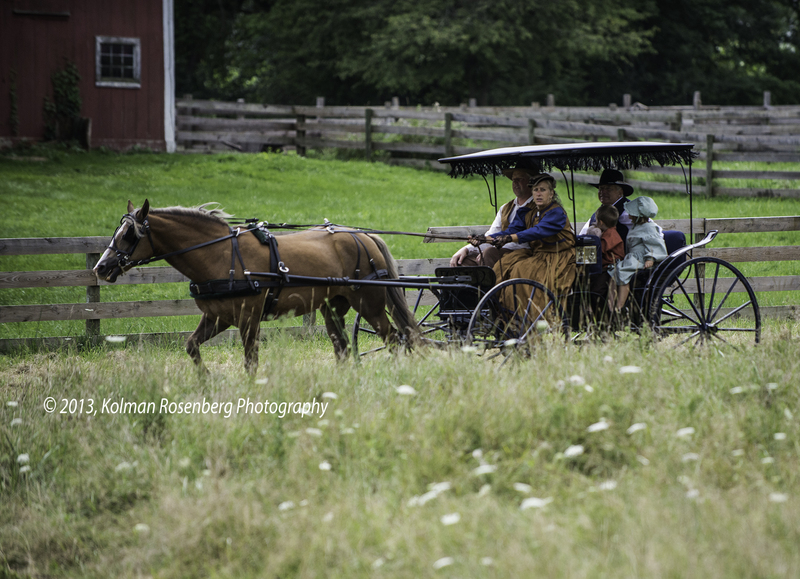 Yesterday I attended the annual Civil War reenactment at Hale Farm and Village, part of the Western Reserve Historical Society. This year’s reenactment seemed much bigger than in previous years and the battle plan was changed to reflect the 150th anniversary of the battle of Gettysburg. This first image shows a family of reenactors as they warned the Union troops of approaching Confederate troops that they had seen outside of town. As the battle commenced and guns and canons roared, the crowd was treated to a sight I had seen before, but never so clear! It’s unusual to be able to get the exact moment a canon or gun fires, showing the muzzle or canon flash but then what followed really amused the crowd. 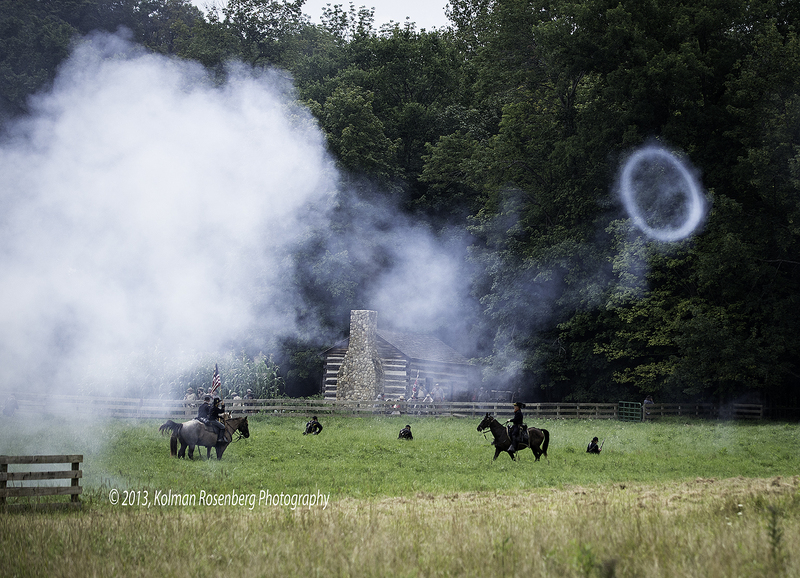 Canons often produce a smoke ring! It only happened on a few of the shots and I had seen it at other events, but this smoke ring just went on and on, rising into the air and lasting like what seemed like a full 30 seconds! The crowd was just oohing and aahing as it persisted! Quite an unusual sight! 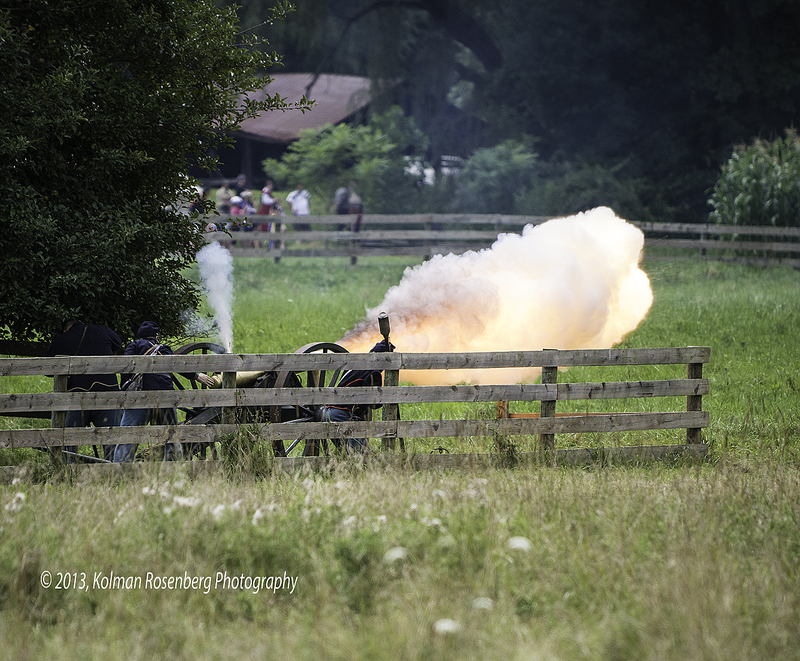 This entry was posted in Uncategorized and tagged canon, Civil War, Flash, hale farm, muzzle, reenact or, reenactment, smoke ring, western reserve historical society. Bookmark the permalink. Thank you for sharing this treat with us. I was there earlier this year for the old time music festival. It is always interesting to see how many different views are taken of the same location. It changes by the type of event and by the eye of the photographer. The photographs you have here are quite fine. The firing of the cannon and the smoke ring are especially good. Thanks Patricia! Yes, as many times as I’ve been to Hale Farm, there always seem to be new things to dee and photograph! More to come Lin! Stay tuned!